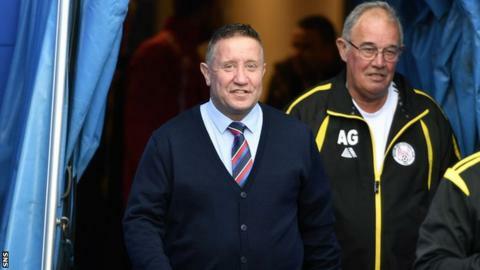 Inverness Caledonian Thistle manager John Robertson admits he is shocked to be back in the dugout. Robertson took charge of his first competitive game in his second spell as boss of the Highland side as they swept aside Brechin City 3-0 in League Cup Group A.
Falkirk beat Stirling Albion 4-1 in the group's other match. "It was a situation I never thought I'd find myself in," Robertson told BBC Scotland. "I hadn't applied for the job. I wasn't 100% sure if I would go back into management, I had a good job at Hearts. I spoke to the club, it was a very positive chat. It was a complete shock. "They were spot on - in a year's time I would have regretted it." Robertson was Inverness CT manager from 2002 to 2004, leading the club to the top flight for the first time in their history. It is a feat he hopes to repeat after the club's relegation last season, and has been encouraged by the recruitment of eight players over the summer. "It'll be a positive, attacking team, that's the way I try to play, and try to entertain people," said Robertson. "I've been encouraged by the talent that's out there. I can assure everyone they're not coming here for the money, they're coming here for the chance to stay full-time and play and get their careers on track. "We've got a good squad of players together. We want to be in a place to try and qualify from the group stage and then be ready for an absolute blockbuster of an opening league game against Dundee United." Gary Warren scored a first-half double for Inverness before George Oakley added a third to give them a winning start to their League Cup campaign. It is Falkirk who occupy top spot in the group, though, after Nathan Austin, Joe McKee and Alex Harris' first half goals were added to by Aaron Muirhead's penalty. Darren Smith's goal three minutes from time gave the Binos a consolation. Match ends, Inverness CT 3, Brechin City 0. Second Half ends, Inverness CT 3, Brechin City 0. Corner, Brechin City. Conceded by Gary Warren. Attempt missed. Collin Seedorf (Inverness CT) right footed shot from outside the box is just a bit too high. Attempt blocked. Liam Polworth (Inverness CT) right footed shot from the right side of the box is blocked. Attempt blocked. John Baird (Inverness CT) right footed shot from outside the box is blocked. Attempt missed. Jordan Sinclair (Brechin City) right footed shot from outside the box misses to the right. Willie Dyer (Brechin City) wins a free kick in the defensive half. Foul by John Baird (Inverness CT). Substitution, Brechin City. Elliot Ford replaces Euan Spark. Substitution, Inverness CT. Matty Elsdon replaces Iain Vigurs. Corner, Inverness CT. Conceded by Euan Spark. Substitution, Brechin City. Jordan Sinclair replaces Ally Love. Kalvin Orsi (Brechin City) wins a free kick in the attacking half. Attempt missed. Kalvin Orsi (Brechin City) right footed shot from outside the box misses to the right. Substitution, Inverness CT. Joe Chalmers replaces Jake Mulraney. Foul by Collin Seedorf (Inverness CT). Ally Love (Brechin City) wins a free kick on the right wing. Attempt missed. Riccardo Calder (Inverness CT) right footed shot from outside the box is close, but misses to the right. Attempt missed. Jake Mulraney (Inverness CT) left footed shot from outside the box is close, but misses to the right. Attempt blocked. Jake Mulraney (Inverness CT) left footed shot from outside the box is blocked. Foul by Jake Mulraney (Inverness CT). Ally Love (Brechin City) wins a free kick in the defensive half. Foul by Ross Draper (Inverness CT). Attempt saved. George Oakley (Inverness CT) right footed shot from the centre of the box is saved in the centre of the goal. Goal! Inverness CT 3, Brechin City 0. George Oakley (Inverness CT) header from the centre of the box to the bottom right corner. Assisted by Iain Vigurs with a cross following a corner. Corner, Inverness CT. Conceded by Willie Dyer. George Oakley (Inverness CT) wins a free kick in the defensive half. Attempt blocked. Liam Polworth (Inverness CT) right footed shot from outside the box is blocked. Paul McLean (Brechin City) is shown the yellow card for a bad foul. Jake Mulraney (Inverness CT) wins a free kick in the attacking half. Attempt missed. John Baird (Inverness CT) header from the right side of the six yard box is just a bit too high following a set piece situation. Jake Mulraney (Inverness CT) wins a free kick in the defensive half. Foul by Aron Lynas (Brechin City).